These were a goodwill find, even at 25% off they were way to expensive for what they are. I had no idea on these, I knew they were from an odd company, they were very modern and they had age. I did a quick search and typical folding chair prices came up but then I see an unusual set similar to this by the same manufacturer that had a high price tacked onto them. With reluctance I bought them, 14.99$ each with 25% off. I took them up to the front, and just randomly happen to be in the line that the manager was running. I told her I cannot believe how corporate these stores have gotten and how I am paying close to 30$ for a pair of chairs that I literally have to touch ever square inch of. She then proceeded to tell me that she knew someone would want these chairs, aka as she said Antique chairs. I then clued her into the fact they are NOT antique. She then was going to stand her ground! I was complaining about how there is no Goodwill left in the "goodwill" stores. She proceeded to brag about how they are not related to other goodwill's and that I could pull up her CEO's paycheck online. He only makes 105,000.00$ a year. I was OH WOW I am really amazed, I had to back down before she pulled out a shotgun. I was OMG 105k a year for a CEO of an organization that is suppose to help out others. Society is super amazing! I just want my run down, abandoned in the 70's church in a little o farming community where junk is still just junk and not "Main Stream"
I was attempting to make the purchase worth the purchase, by telling myself and my buddy that I could list them for a few hundred on Etsy when I start listings. When secretly I figure I would more then likely be stuck with them and consider them as garden chairs. Searching for a couple of nights, I could only find a few ads on these chairs and nothing more. They did give me a few clues. The model number 1151, price and original style. I still couldn't find any others like these, I really wanted to find an ad or completed something or another to know my entry fee was worth it and well future labor hours. There was nothing! 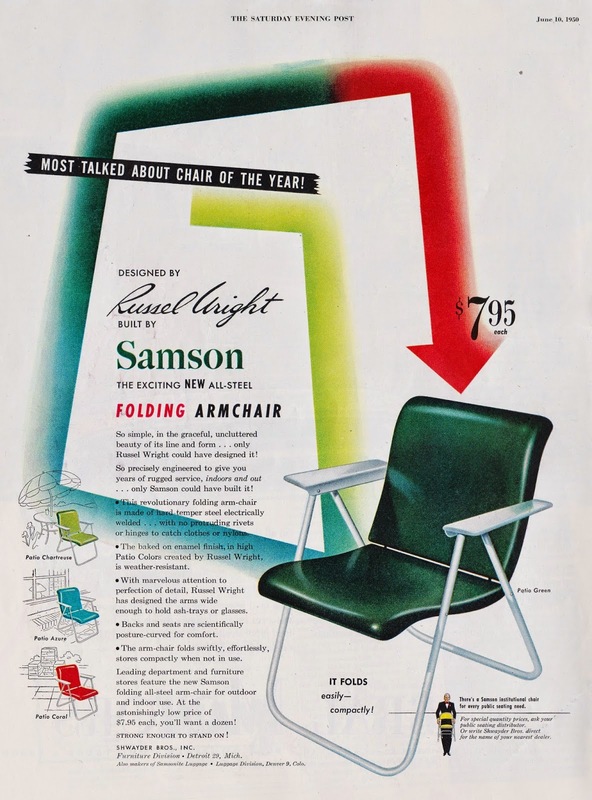 The only similar armchairs by Samson better known as Samsonite for their luggage were designed by Russel Wright. These were sold in 1951 at a cost of then 7.95$. The ad for my chairs appeared in 1949 and they had a cost of 14.95$. Funny to think the Goodwill had them priced four cents higher then they cost new. That would be almost 150$ a chair today. Way higher then the Russel Wright designed ones. Then mind you, a table in that exact same ad was only $12.95. I imagine not many of these were sold at that price in those days. We then get to the condition of the chairs, as proof that many likely didn't survive. 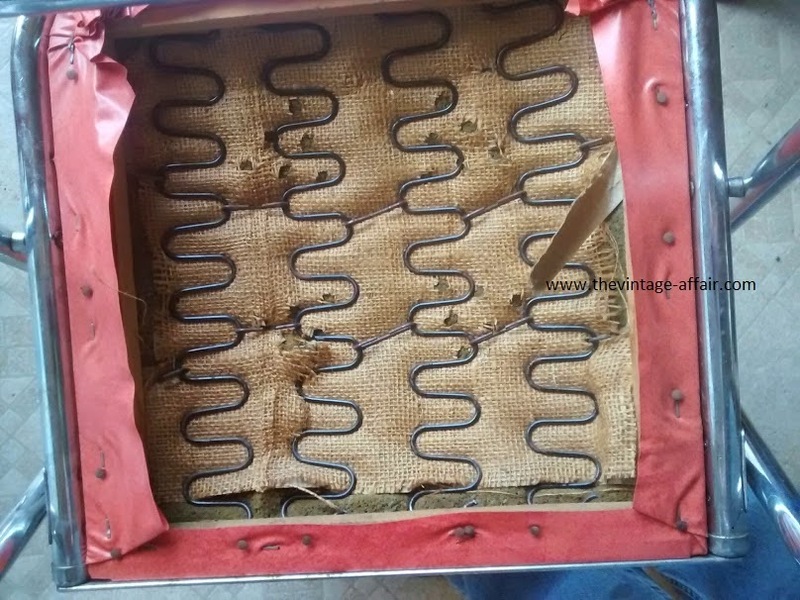 We can see that they are constructed of a wooden frame, spring and foam rubber cushion. It is then covered in a thing plastic/vinyl material. Then the frame itself is chromed metal. All these design features, do not fair well with age, as you can see. So most of the ones sold, hit the scrap yard long long ago. With no information or completed auctions to give me any information or the market for them. I am at a complete loss as what to do with them? 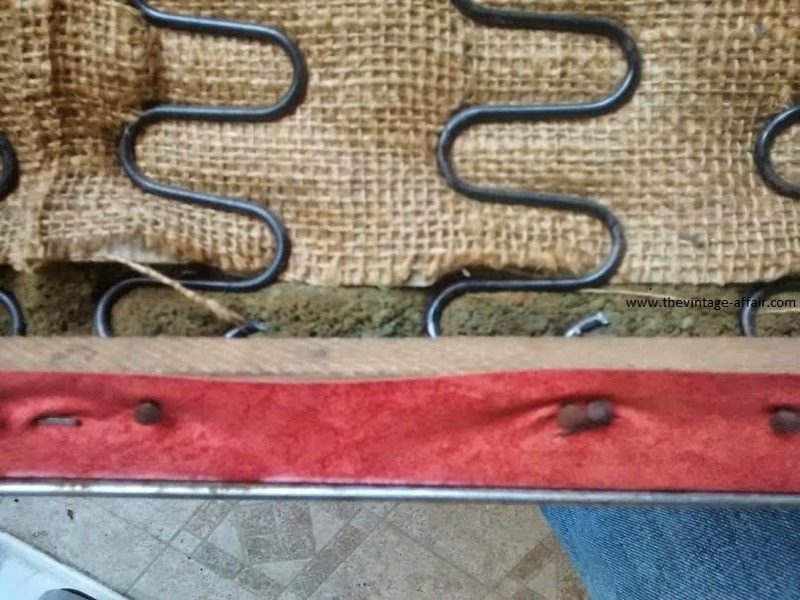 My plans are/were to clean them and re upholster them in a similar color material. Since I have so many chairs floating around, they will head into the pile o chair projects for future use and restoration. Maybe with in that time, some more information may come on board about them. I really like the style of them, but because I cannot find any value information on them. They will just stay on that back burner until I get the time to tackle them or the space to use them. Finding a similar non clashing material for them will also take some time. Polishing all the chrome, will take hours. You may have noticed copy right stuff on the photos. I figured since I am running a site now, I better protect my photos encase some idiot tries to start a fake auction or sale ad on Craigslist. It will become better in time, I just discovered I had my camera set of Panorama mode still. Gosh I feel old with technology now. I was just watching on The Real and they were discussion the hash tag and how to use twitter and instgram. I suppose maybe I am just to intelligent to understand this "Main Stream" technology crap.